Door Hardware from Emtek, Schlage and More. 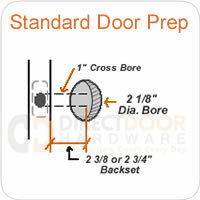 Start Here: Shopping for door hardware is not as complex as it can seem. Most door knobs and levers these days fit standard measurements, so that is the first thing you want to check. Verify what backset you have, how thick your door is, and the size of your bore holes. You can verify your own measurements against standard door preparation. If they are a match, the majority of door hardware brands and styles will fit your doors. Have an odd measurement? We'd be happy to help. Contact our Door Hardware Support team or call us at 877-852-9449. Our help desk is open 9-5 (mountain time) Monday through Friday. Give us a call and we'll help you find the right door hardware for your application. So you are in the market for some new door hardware? Whether you are looking for replacement for your old outdated and worn out doorknobs, or you have a new home or project... we have the door hardware for your project. We've been providing great customer service to home owners and builders for 10 years as a leading online retailer of door hardware. Before ordering your hardware there are several things you ought to consider. For example, do you prefer the simplicity of a door knob, or would you prefer a more elegant look of a lever handle. We have hundreds of styles to accomodate your own personal taste or design style. As you begin shopping, it's important to know how your doors are prepped so that you can order the correct hardware for the job. Our Door Hardware 101 article will help you determine what you need and will help you be more familiar with terms we may use throughout the website. To get you started in your decision on the design, here are a few things to think about. Doorknobs are going to be the least expensive option for new or replacement hardware. Door knobs are pretty standard in size and are comfortable to hold in your hand. Most doorknobs that the majority of us are used to are a formed zinc die cast type knob that is hollow inside. These are the most affordable and common door knobs. If you like the simplicity of a door knob, but want something nicer, you might consider Emtek or Baldwin brand doorknobs as they are made of solid brass and have a nice solid feel. For a more elegant look, check out our huge selection of door levers. We have levers in many brands and hundreds of styles and finishes. Levers often require a little more planning when ordering as you may have to specify your door handing, but the upgraded look it worth the time spent.